Our Health Thru Nutrition Pycnogenol® is the most extensively studied and purest pycnogenol available anywhere. 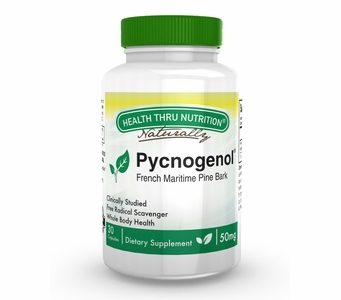 Pycnogenol® is the patent protected French maritime pine bark extract which acts as a potent blend of antioxidants that work synergistically for multiple anti-aging benefits including support for the protection of elastic tissue proteins and the genesis of new collagen and hyaluronic acid in human skin. Pycnogenol® is nature’s Super Antioxidant to help you look, feel and live better. As one of the most potent natural scavengers of free radicals, Pycnogenol® mops-up aggressive radicals before they cause damage by oxidative stress. Its super-antioxidant capabilities help boost the immune system and strengthen blood vessel walls and capillaries. It helps maintain healthy circulation by supporting relaxation of arteries. Why Health Thru Nutrition Pycnogenol®? As with all of our products, we choose only the highest quality, purity, and clinically proven ingredients to ensure efficacy, safety and best value for you. This unique, French maritime pine bark extract is grown exclusively in an unspoiled and natural forest in southwest France. Neither pesticides nor herbicides are ever used in this pristine pine tree forest. The purity and potency of Health Thru Nutrition Pycnogenol® are continuously monitored. Over the past 40 years, Pycnogenol® has been the subject of extensive research that has resulted in more than 100 published clinical studies and 300 scientific publications. This extensive research has shown Pycnogenol® is a non-toxic, powerful and effective antioxidant with a variety of health benefits. 40 Years of Research helps you look, feel and live better today! Other Ingredients: Maltodextrin, gelatin, magnesium stearate and silicon dioxide. Free of: Milk, egg, fish or fish by-products, shellfish, tree nuts, peanut, wheat, and soybeans. Directions: Adults: Take one (1) capsule daily as a dietary supplement, or as recommended by your healthcare professional. Keep bottle tightly closed. Store in a cool, dry place at controlled room temperature 15°C-30°C (59°F-86°F). Health Thru Nutrition™ is a registered trademark of EPIC. Use of this product may be protected by one or more U.S. Patents or other International Patents.